This was a truly action-packed issue of Teen Titans, and for once every member of the team had their chance to shine in the same issue. If you like great battles, this is definitely an issue of TT you don’t want to miss! This is a team finally learning how to work together in a way they haven’t done before in the New 52, and they are proving to be a most formidable group. But, can even this level of teamwork succeed…or even survive…against the sons of Trigon? This issue picks up with Raven firmly on the side of the Titans, and the battle beginning against her three very formidable brothers. The Titans use strategy as well as force, separating the brothers to give themselves a chance. This gives us the opportunity to see some interesting team-ups within the group. 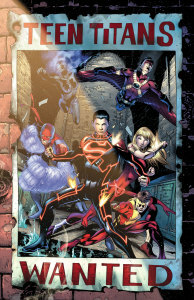 Wonder Girl teams up with Bunker, who is becoming more powerful by the issue as the creators seem to be learning how to best use him as a character. 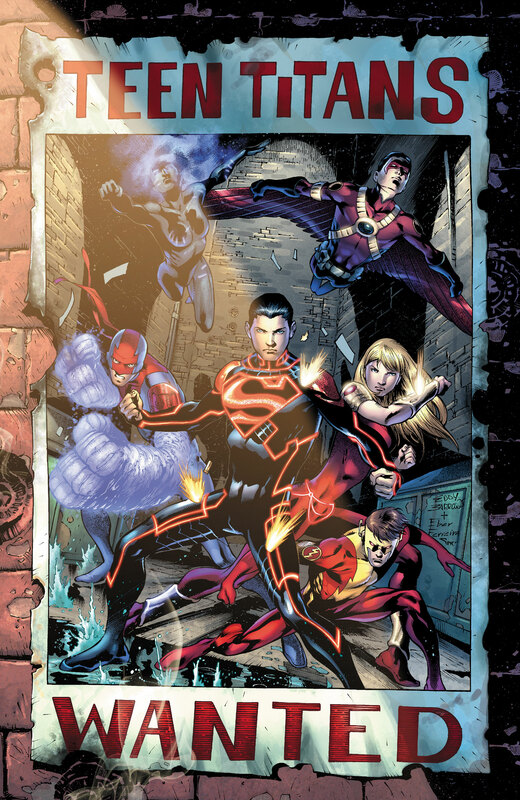 Red Robin, Superboy, Raven and Beast Boy all team together, and we see Tim’s leadership skills while also learning more about Raven’s powers in the New 52. It was good to see Superboy more trusting of the team, and to see Beast Boy get his spotlight with a use of his powers that made sense to me in the heat of the battle. As for Kid Flash? He not only gets his chance to shine in battle but also gets to team up with Solstice…you’ll want to read the issue for this alone if you’re a Bart fan! The team is being watched…and not just by Trigon, but more on that will likely come up in future issues. As for Trigon…can’t spoiler the ending of the issue, but Trigon is definitely ready to take a more personal hand in this battle! The art was amazing this issue! The page layouts were very highly creative, turning what might be an ordinary splash page into pages that drove the story forward while still conveying the power and intensity of the battle. The use of color, light and shading was pitch perfect throughout. Scott Lobdell provided the story and Tony Bedard the dialog in an excellent script for this issue. Eddy Barrows and Jesus Merino, with colors from Pete Pantazis, did a stellar job with the artwork here. It’s funny – there was a point earlier in the run of the New 52 Teen Titans where I was a bit frustrated with where the characters were in their development and where the storyline was going. There was none of that concern here – great characterization, great pacing, great storyline, great artwork…if this is where the Teen Titans are headed in the New 52, I’m more than glad to be following along! This entry was posted in Reviews and tagged Bart Allen, Kid Flash, Raven, Teen Titans, Trigon on June 29, 2013 by Ed Garrett.